California is in the midst of a major fire, fueled by high winds that have made firefighting extraordinarily difficult. So far the state has spent around $75 million on firefighting, but this is only a fraction of the real cost of the fire which is not expected to be fully contained until well into 2018. So far the fire has consumed 272,000 acres, making it the second worst in modern California history. But it will soon exceed the worst fire, in 2003 called the Cedar Fire, that consumed 273,246 acres. The real cost has to be measured in property destroyed, which will run into the billions of dollars, lost productivity, crop damages and loss of tax base. When it is all added up, it will cost California, insurance companies and Californians tens of billions. California is a state that has the nation’s largest firefighting fleet of fixed and rotary wing (helicopters) aircraft along with large fire brigades and ground equipment. Among the aircraft is a monster Boeing 747 “Global Supertanker,” a Lockheed P-3, a Douglas DC-6 and a McDonnell Douglas DC-10. These aircraft are operated by private companies and are under lease-type agreements with California. For example the DC-10 is operated by 10 Tanker Air Carrier based in Albuquerque, New Mexico and the Boeing 747 is operated by Global SuperTanker Services in Colorado Springs. The hire of aircraft and services is rather common in fire fighting in the United States and elsewhere. With the exception of the CL-215 and CL-415 “super scooper” aircraft, the planes California relies on fly a mission and then have to land and be refilled, which takes precious time. A scooper aircraft is different because instead of landing each time after it empties, it can scoop water from the ocean, river, bay or lake and return to its firefighting mission. 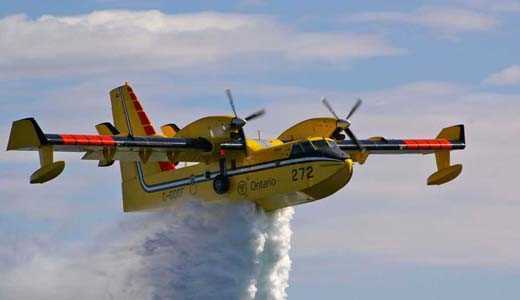 The CL-415, known as the Bombardier Water Bomber can scoop up 1,620 gallons of water and it can, if desired mix the water with a chemical retardant. It is a turboprop aircraft that was built for the single mission of firefighting and was the successor to the older and smaller CL-215. California uses both. The Canadian aircraft have been used worldwide and have been effective. 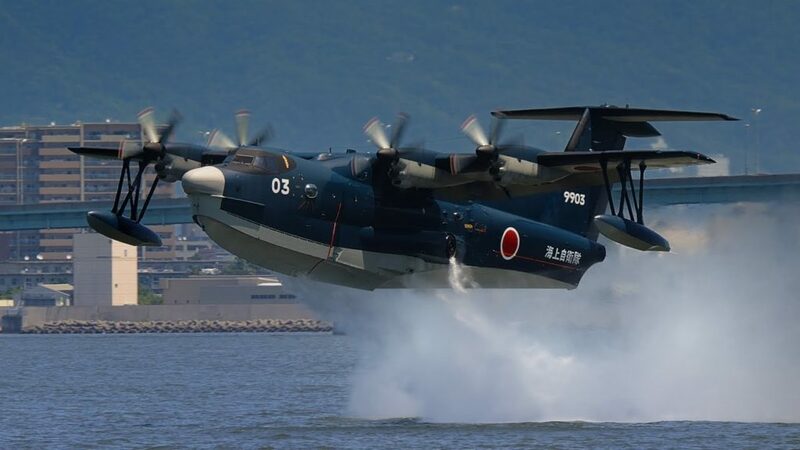 Japan has a larger scooper aircraft of its own, the US-2 but so far at least has only deployed one prototype in the firefighting mode. The US-2 prototype was purpose built for firefighting, but its predecessor, the US-1 was a multimission aircraft that can be used for anti submarine warfare, close surveillance and for search and rescue operations. China now has carried out its maiden flight of a new amphibious multirole aircraft, the AG-600 Kunlong (Honored Dragon), a four engine turboprop similar to Japan’s US-2 but larger. It is claimed it can carry 12 tons of water or 3,000 gallons compared to the US-2 which is capable of carrying 2,000 gallons. But China has many other plans for the AG-600, especially for protection missions for its aggressive islands program in the South China Sea and whether it will ever serve a firefighting role is uncertain. Americans don’t know very much about the Russian Beriev Be-200, but perhaps they should. 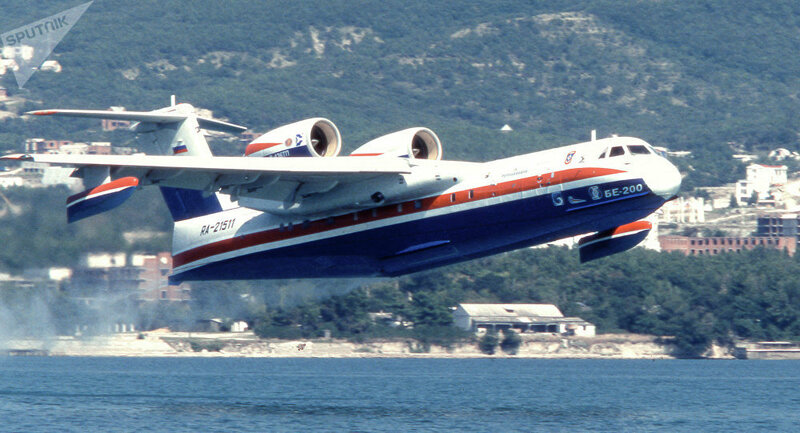 Unlike the Bombardier, ShinMaywa US-2 and the Avic AG-600, the Beriev is a twin turbofan jet powered multirole aircraft with a proven fire fighting record. It has been used in Europe and Asia including Italy, Portugal, Greece, Azerbaijan and (in a search and rescue operation) in Indonesia. The most dramatic use was in Israel where Russia dispatched two Beriev’s in 2010 to fight a devastating forest fire in the Mt. Carmel area that threatened Haifa. 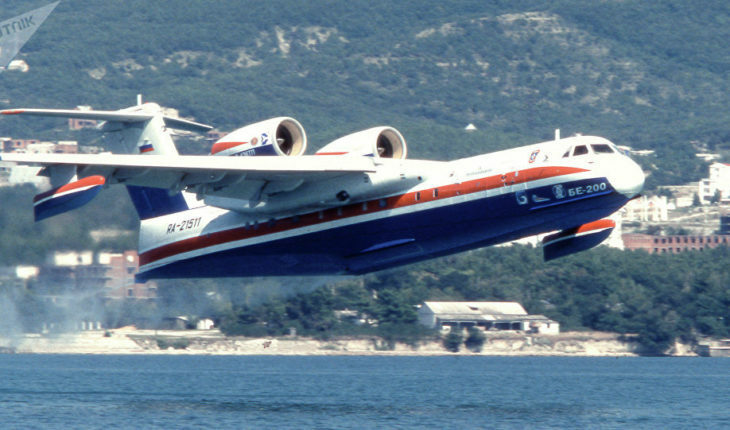 The Be-200 can scoop up 3,170 gallons of water and mix it with chemical retardent, much like the CL-415, but it carries a larger load (almost 3 times) and flies faster because of its jet engines. Its engines and airframe are fully marinized meaning that it resists corrosion caused by water and salt. Does California need the Berliev, given the fleet of aircraft already at its disposal? Deciding about the Beriev depends on how the emergency responders in California think they have coped with the ongoing Thomas fire and what they need in future, but one can argue full consideration should be given to the Beriev. It is cost effective with the Russian delivered price of around $40 to $45 million per copy. This compares to a passenger Boeing 737 which is twin engine and ranges in cost from $51.5 million and $87 million. The smaller CL-215 is priced at around $30 million. It has European certification(2010) but it will need FAA certification for U.S. operation. There are at least two companies that want to produce the Be-200 in the United States, one in Colorado and the other in California. The aircraft is capable and is equipped to carry out emergency search and rescue missions. In a rescue format, it can carry 72 passengers. In a medical evacuation it can carry 30 stretchers and seat another 7 plus have room for a medical team and needed rescue equipment. Because it is a fixed wing jet aircraft it can get to an offshore location rapidly. As a result it can augment Coast Guard operations both in supporting search efforts and in rescue. The Coast Guard has leased aircraft before, so there is already a precedent to have the Be-200 on standby. Many of the aircraft and helicopters that California relies on are old platforms that have been modified or partially refurbished for firefighting. They are expensive to operate and availability is always an issue with older equipment. The Beriev as a new aircraft with U.S. avionics should be more supportable and its rate of availability higher than with thirty or forty year old platforms. In addition the risk of in-flight failure and accidents is lower. A direct deal with Russia could potentially meet U.S. foreign policy objectives should there be a thaw in U.S.-Russia relations. Some will argue that along with its civilian role, the Russian military uses the Beriev for antisubmarine warfare and surveillance as well as for search and rescue. Does that disqualify the Beriev in the United States? Obviously it should not, since the U.S. uses civilian platforms for military operations, both fixed wing and helicopter. The Boeing 737 has been modified and is being used by the Navy as the P-8 Poseidon Multimission Maritime Aircraft (MMA). The Russians know this but buy Boeing aircraft for their commercial fleet including the 737-800, the same platform that was modified for the P-8. This past September the Russian Duma took up legislation that would restrict Russian air carriers from purchasing and leasing of foreign aircraft as a means of supporting Russia’s domestic airline manufacturing. Should this step be implemented it will freeze any chance for the Beriev or any other Russian aircraft entering the U.S. or European marketplace. The Russians need to urgently rethink the proposition of trade restrictions, especially as they are actively marketing their Superjet 100 commercial aircraft around the world. There isn’t any doubt the possibility of a Beriev deal would be killed off if the restriction on foreign purchases is implemented by the Russian government. Likewise it would also remove competition inside Russia and ruin cooperation with European and American aircraft and jet engine makers. In short, the Russian Duma has floated a very bad, counterproductive proposal that belongs in the trash can.